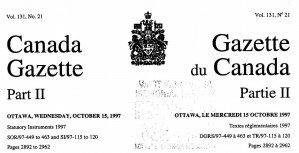 The year was 2000 and I noticed a seemingly small change was made to Canada’s Coat of Arms, the symbol of legal authority for governing Canada. A “simple” circular “banner” was added to the background surrounding the shield. That’s all. Or was it? 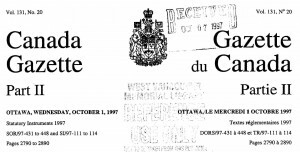 The official date the new design was approved by the Queen officially on July 12, 1994, but the changes had not been made in many departments of the government until beginning in 2000. 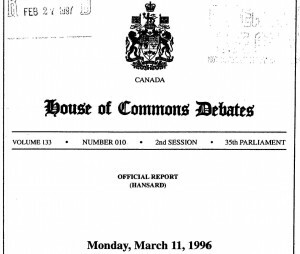 The House of Commons Debates record shows the first change to using the new Coat of Arms did not appear until March 12, 1996 and the Canada Gazette did not display the new version until October 15, 1997! Was adding the ribbon a convenient excuse to cover up a “legally required” change of the other elements? A flag is recognized as representing the law as is a Coat of Arms. Change the flag and the law changes. The changes are easy to see if you know what to look for and they add up fast. There are eight major elements to the design and each element has multiple aspects, every element changed. The first and most obvious change is that the “old” flags had fringes. Gold fringe on the British flag and silver fringe on the French flag. There are many thoughts on the meaning of fringe which we will address another time. The new design now displays those two flags each with no fringe. Can you spot the other changes? Throughout government offices in 2000 things were changing. 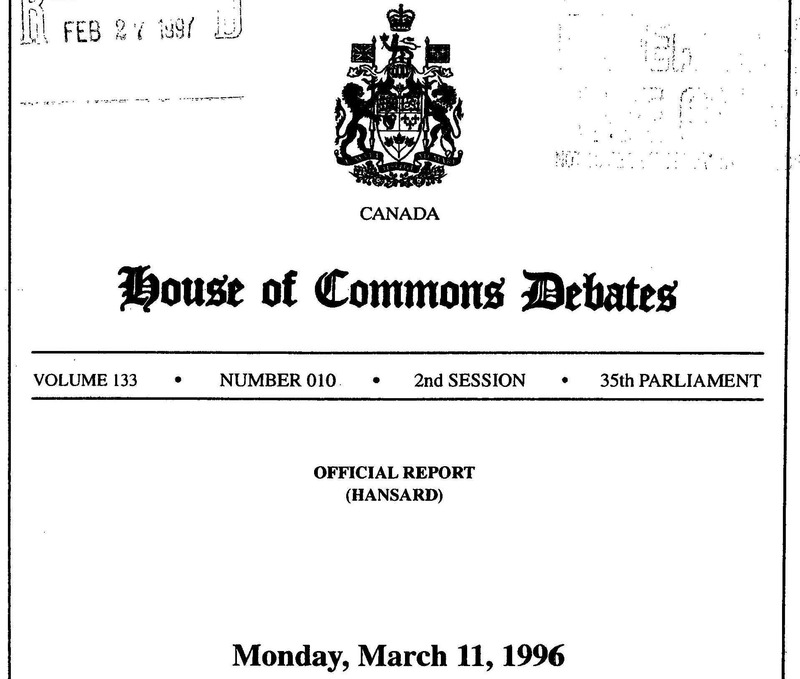 Every letterhead and sign using the old needed to be updated with the new? Here’s a scan from the Privacy Commissioner’s office letter. The first letter I received in 2000 had the “old” Coat of Arms and by early 2001 it was this new version. 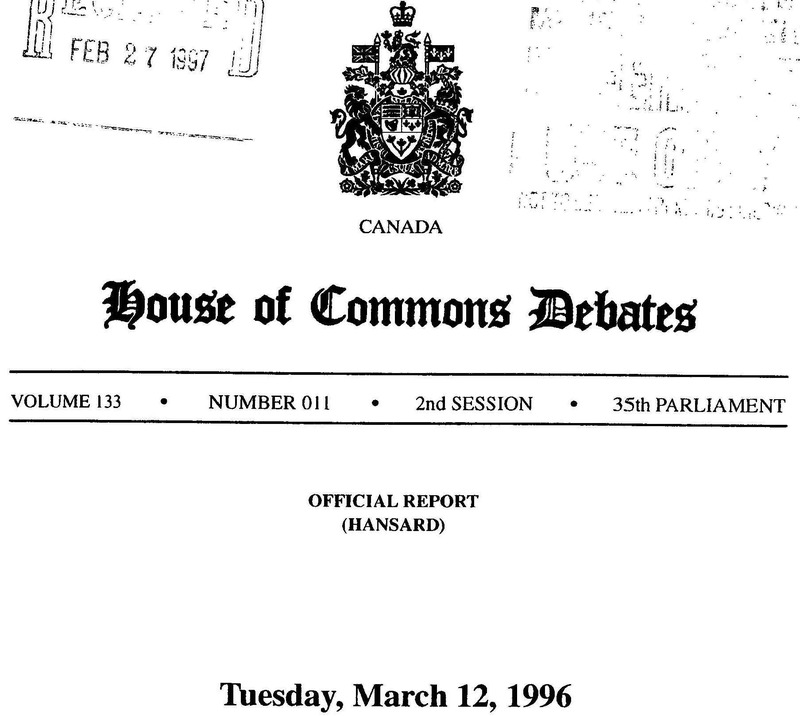 The House of Commons Debates Official Report, the Hansard, first shows the new version on Volume 133, Number 011 – March 12, 1996. Almost 2 years after the official change. 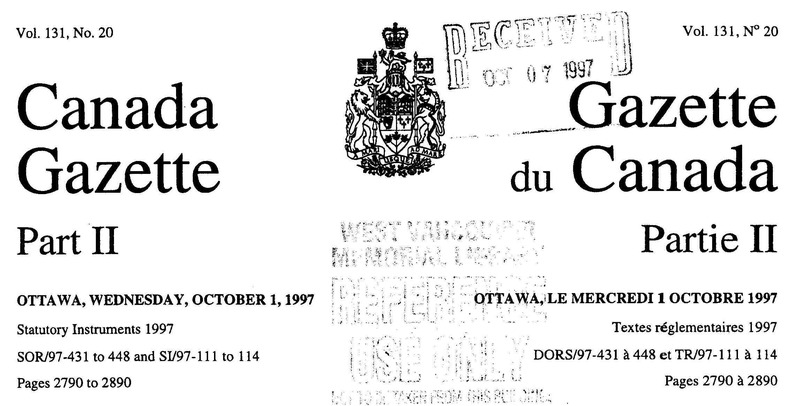 The Canada Gazette first shows the new version of the Coat of Arms on Volume 131, Number 021 – October 15, 1997, seven months later! Over 3 years after the official change. So what you say? The Coat of Arms is recognized in law like a badge on a police officer, no badge equals a private citizen and no official powers. What does it mean when a legislature issues law under a “badge” of authority that has been out of issue for years? Why was it necessary to remove the fringes? I bet the addition of the circular banner was the excuse to reissue the Coat of Arms without the fringed flags because of a legal requirement to remove the fringed flags. There are many questions here that will be explored in the future. Anyone want to help research and discover what may have been going on? Also note that many government departments have been, and are being, sliced off and turned into “agencies” corporate governance style. 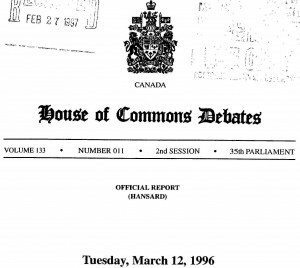 The changes to departments needing to use the new Coat of Arms really accelerated in 1999, but the first changes to the new Coat of Arms were made in 1996-97 on official versions of the Gazette and House of Commons Debates. Hmmmm. Some people believe that the fringe on the flags represents the nation being in bankruptcy, therefore removing the fringe may mean coming out of bankrupcy. A man is in bankruptcy for 7 years and nation is in bankruptcy for 70 years. 1996/7/9 – 70 = 1926/7/9 what happened in those years, hmmmm? Or is there another reason? For example the Department of National Revenue became Revenue Canada, which merged with the Customs Department to form the new “streamlined” Canada Customs and Revenue AGENCY (CCRA), which a few years later split again into two independent agencies. They were joined supposedly to create a “more efficient structure” only to be split apart a couple of years later. What? Not departments of the government anymore, but independent agencies with corporate like structures. It’s hard to discuss one idea without branching off into others because they are really all connected. Watch for updates on this topic. Finally getting to the last issue about the coat of arms changes…triggered by the latest version of brand new plastic Canadian money. I believe the change of the coat of arms and other changes represent legal changes at the legal foundation of the country. there is a real Canadian maple leaf shape dominating, the 13 point copyrighted artificial maple leaf is still seen but secondary to the “real” leaf. the word “Canada” appears in capitis diminutio minima (first letter capitalized only). all government websites have been rebranded the last 2 years with a “real” maple leaf appearing front and centre at the top of the page. the artificial 13 point maple leaf. All versions prior to 1954 have no coat of arms. A video on the corporate bankruptcy of USA and Canada. 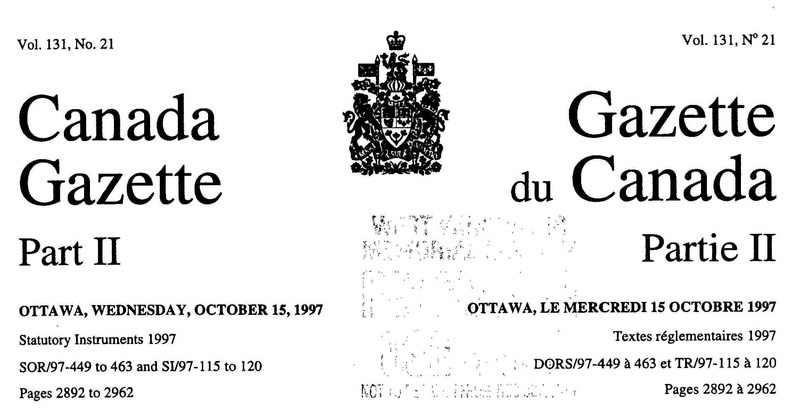 Note the dates that are mentioned and compare the dates to the change in the coat of arms of canada…. The government website designs have undergone dramatic signs of change as well. Keep in mind the law of the flag and the position of authority symbols. Top right or centre is the authority position for coat of arms or flag in the official colours – the appearance of the BLACK BAR top and bottom is of note. The reverse white type for the department and flag is noteworthy. The “natural” maple leaf that appeared to centre has now been moved bottom centre and replaced by the trade marked “artistic” maple leaf. The elimination of the previously required oath of allegiance to the Queen for lawyers.